Last week I forgot to bring my lunch to work, which led to a trip to Sainsbury's and picking up way too many naughty treats! One of which were these chocolate covered ginger cookies, one of my all time favourite treats! Prewett's seem to have two lines of products, their basic line, and new to my store, their luxury line. Being able to pick from more ranges makes me feel more normal! Why should we have to settle for rich teas and bourbons! These biscuits in particular are leaps and bounds above anything else I have tried before. I honestly could have ate the whole box in one go, and considering there are 8 in one box, that's really saying something! At £2.25 per pack, these are comparable to the mainstream brand, Borders. At 96 calories per cookie, these are quite a satisfying sweet treat. 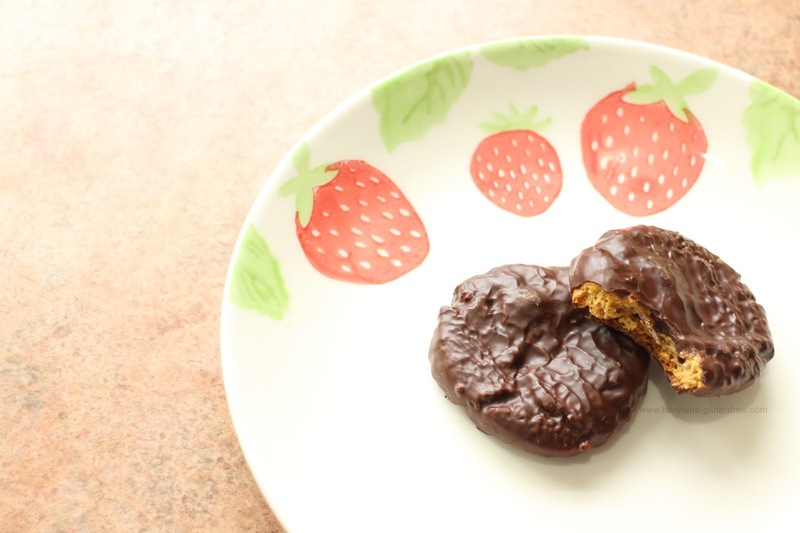 A bobbly cookie with chewy ginger pieces and a dark chocolate coating, these are certainly worthy as a coffee morning treat! Each cookie is around 1cm thick and has a good crunch, but isn't as hard or crisp as some, which I think is a nice change! The rich ginger and chocolate compliment beautifully and the texture is so comparable to the mainstream brand, you really would not be able to tell the difference! Although they do contain milk, there is no mention of egg in the recipe, so this may be an option for those of you who are unable to eat egg too! They are also readily available in supermarkets, so even the older ladies I know who are gluten free and do not use a computer can get hold of these. Things are much better than they were and more of the really tasty gluten free foods are in shops now, but at one point it felt that anything that was worth eating could only be found online! I would love to try more from this range now, knowing how good they are. I would even give these to my gluten eating friends at a coffee morning, to see if they could tell!